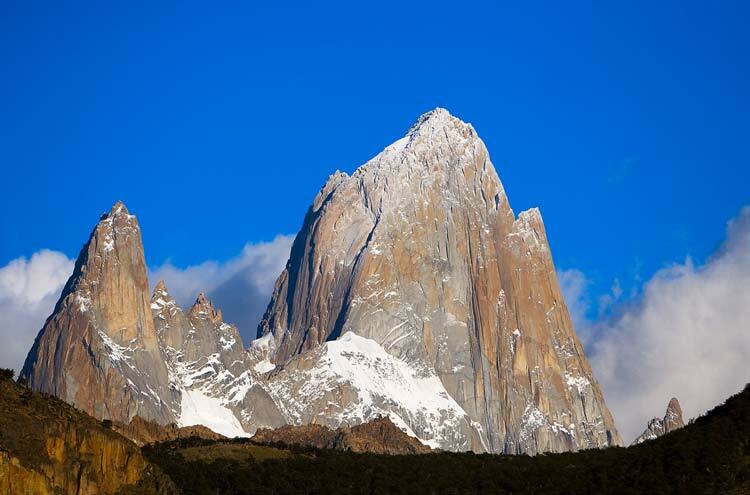 The Fitz Roy Massif is the crowning jewel of the spectacular Los Glaciares National Park, Argentinas finest and a UNESCO World Heritage Site. 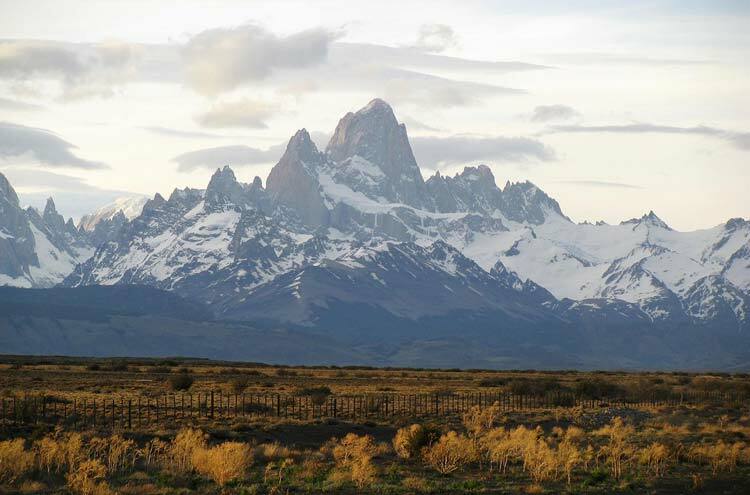 The romance of historic estancias is juxtaposed with vertiginous mountains and awesome nature: panoramas of glaciers, towering granite spires, lakes and Patagonian forest. Superb walking into the heart of this magnificent area. 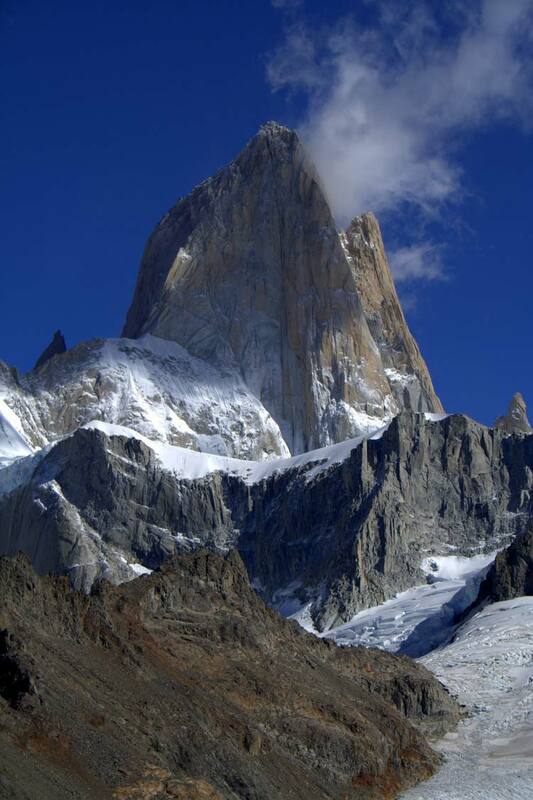 Fitzroy treks take in vistas of its eponymous massif, as well as a second (marginally smaller) granite peak, Cerro Torre. A vast landscape, isolated and empty except for guanacos (close relative to Llamas) and condors, or the occasional gaucho (local). This is wild, remote country and the weather is often horrible. Come well prepared. Note: Negs: consistently bad weather. 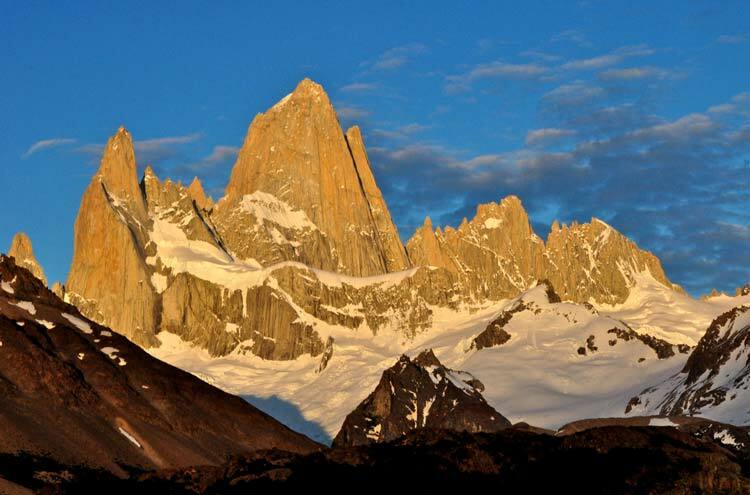 Los Glaciares National Park, host to the fantastic Fitz Roy Massif, is a UNESCO World Heritage Site and, at 8,500sq miles, of a scale matched only by its grandeur. Approximately a third of its area is covered by ice-fields connecting 47 major glaciers, which sets the area apart as the largest continental ice expanse after Antarctica. 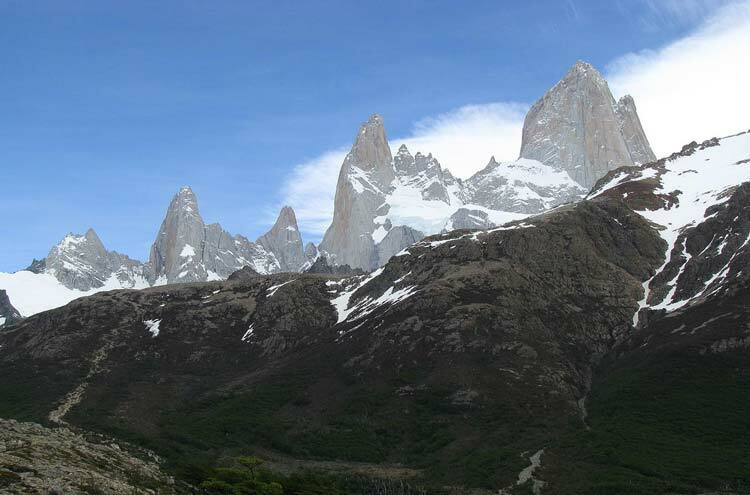 The northern extreme of Los Glaciares is characterized by a range of fantastical spikes, of which Mount Fitz Roy is the most enduring image. A series of jagged, monolithic towers of barren granite thrust into the sky; precipitous cliffs plunge down towards frigid glacial tarns and sparse, indigenous flora. 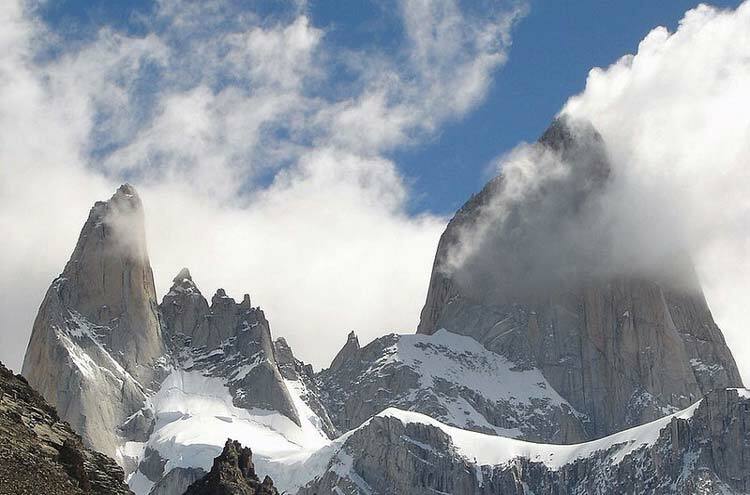 The range's tallest peak, once known as Cerro Chalten (Smoking Mountain), not as a volcano but for the cloud seen to form around its peak, was renamed in 1877 after the captain of the HMS Beagle, Robert Fitzroy. 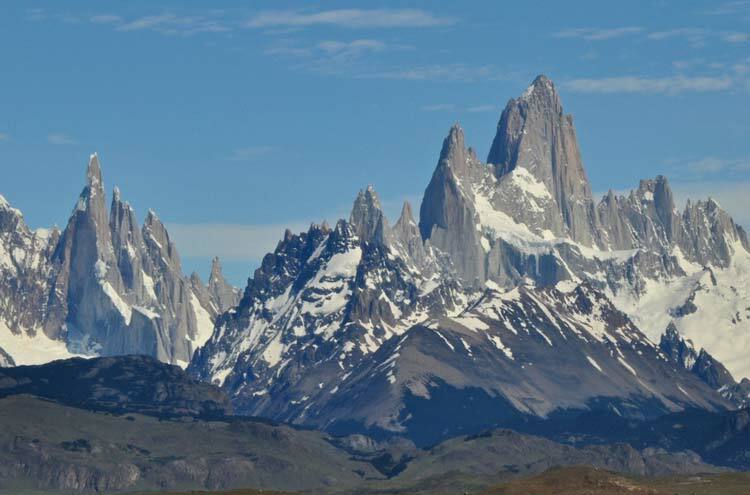 The dramatic mountain was sighted by his 1834 expedition, sailing up the Santa Cruz River to chart the desolate and isolated Patagonian coast: now, it is symbolic of the Santa Cruz province and iconic to thousands of travellers worldwide. 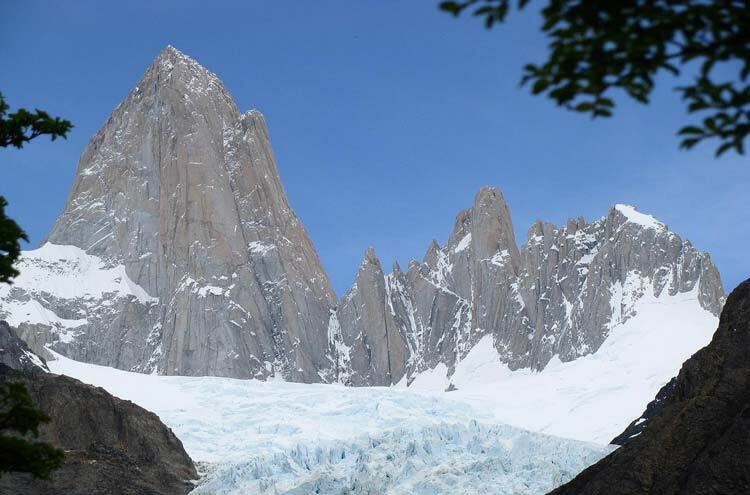 Los Glaciares' virgin landscape creates pristine vistas wherever you turn, and a marvelous variety of otherworldly terrain makes for breathtaking stuff. 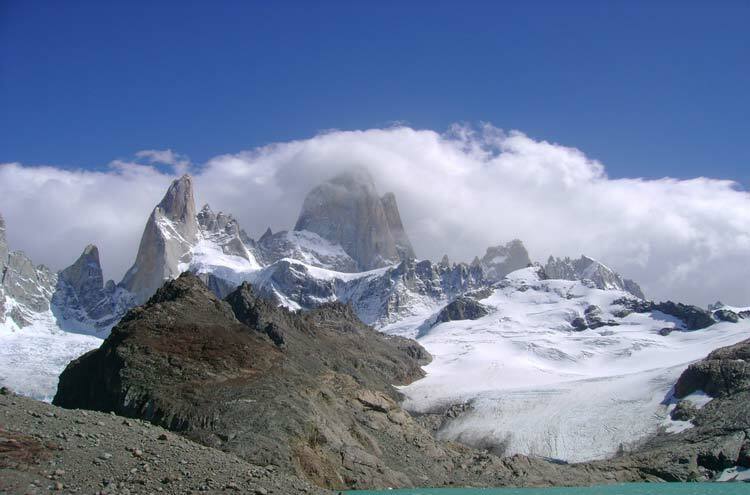 Modern international links (El Calafate Airport) and the growth of El Chalten village offer access to Fitzroy like never before. 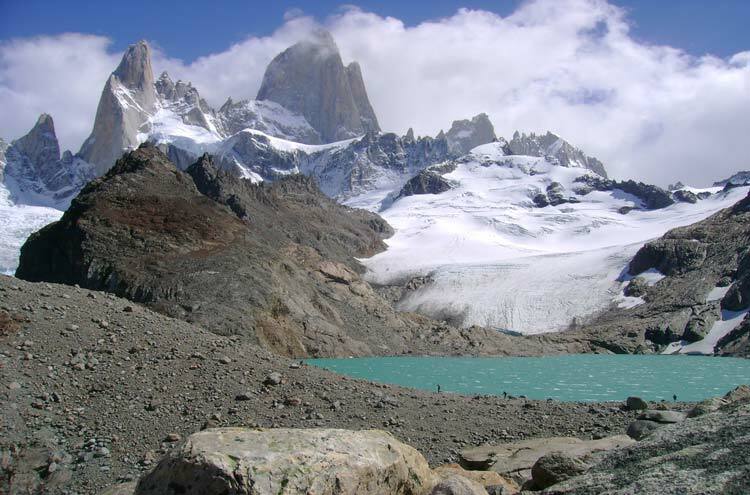 A Fitz Roy trek will typically incorporate both the Fitz Roy and Cerro Torre base camps (thereafter progress becomes exclusively the domain of elite climbers), while trails go on to navigate myriad lakes and outcrops of hardy vegetation, even ascending a few lesser peaks and approaching Viedma Glacier. Hiking here is truly varied. 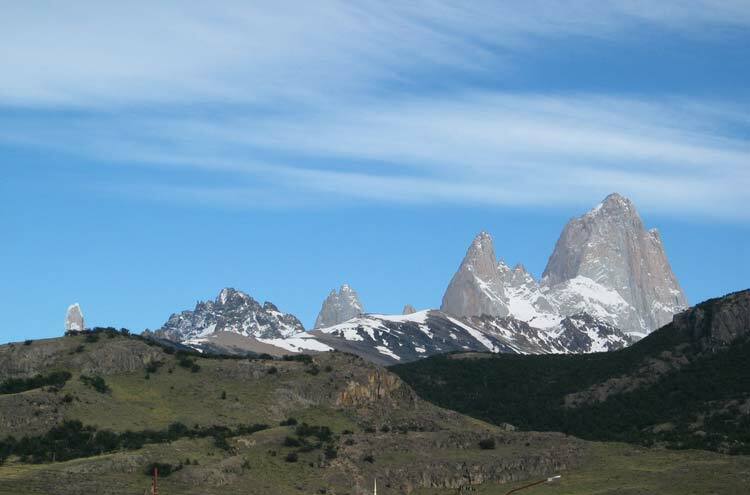 Classic Route: An 11km meander across gentle slopes to the foot of inspiring Cerro Torre (3,128m), joining the Rio Fitz Roy en route. 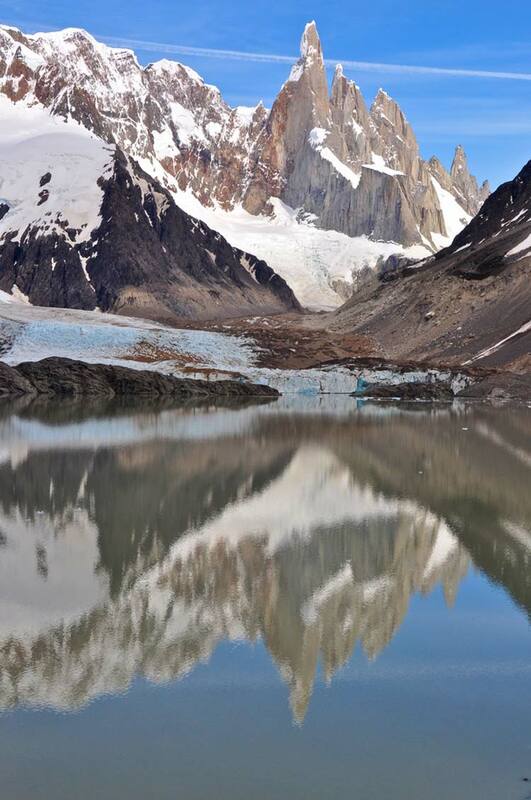 Diversion at Laguna Torre brings you to an even better viewpoint before circling back to Camp Jim Bridwell as Glaciar Torre looms behind. 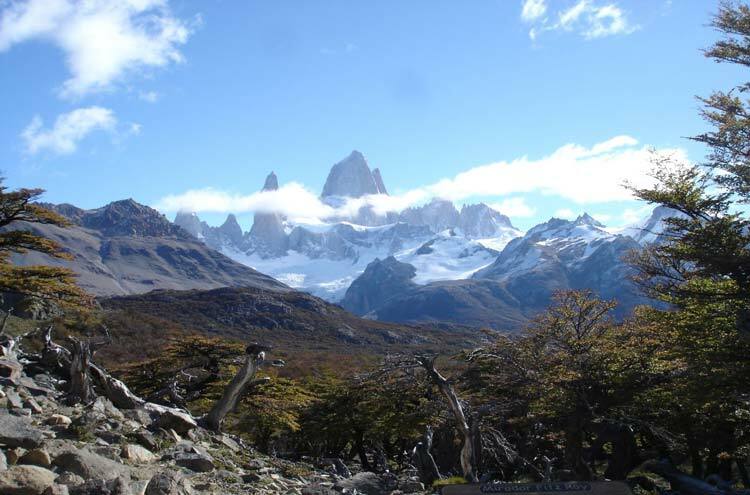 The next day traces a path up to high plateau, then winding through the Lagunas Nieta, Hija, Capri and Madre. 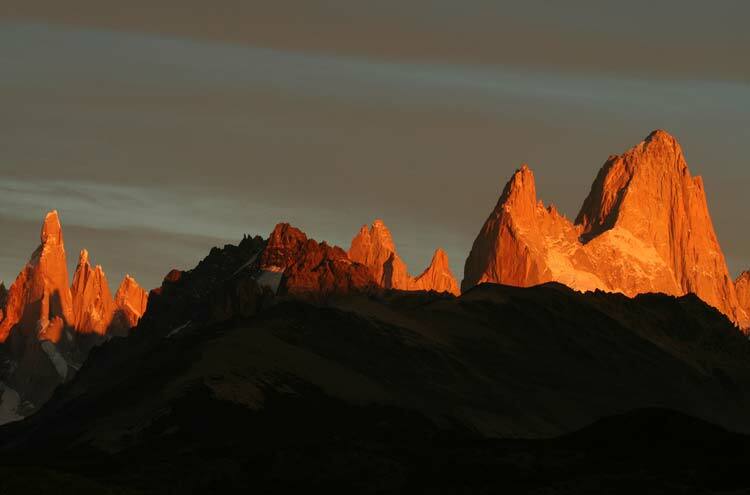 Overnight at Camp Poincenot, and the following day take two separate diversions: over moraine and boulder-field to a rose-tinted Fitz Roy sunrise at Laguna de los Tres, and a second, wilder and more rugged, to the rarely visited shore of Laguna Sucia below Glaciar Rio Blanco. Then, its 9km or so along Rio Blancos banks and up the Rio Electrico valley. Retrace your steps to Camp Poincenot to return, taking a valley to your left for further rewards in scenery and atmosphere, overnighting in the glorious refuge perched above Laguna Capri and looking out over range, river and glacier to Fitz Roys serrated peak. 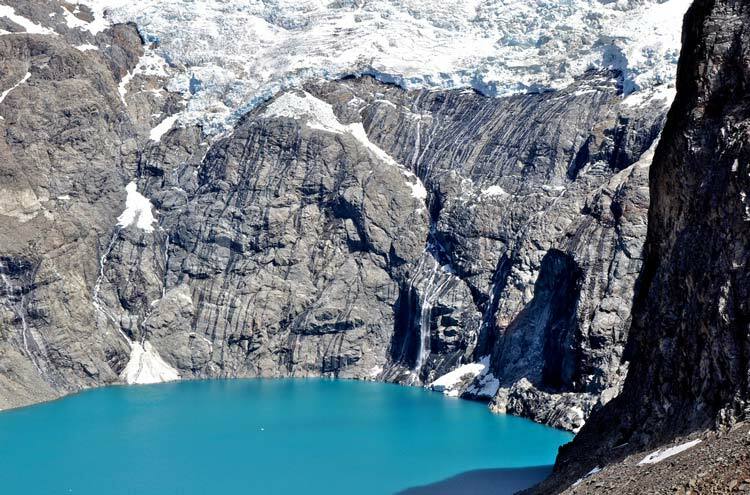 A Circuit: This can only be done by hikers with experience of glacier-walking, and guided. 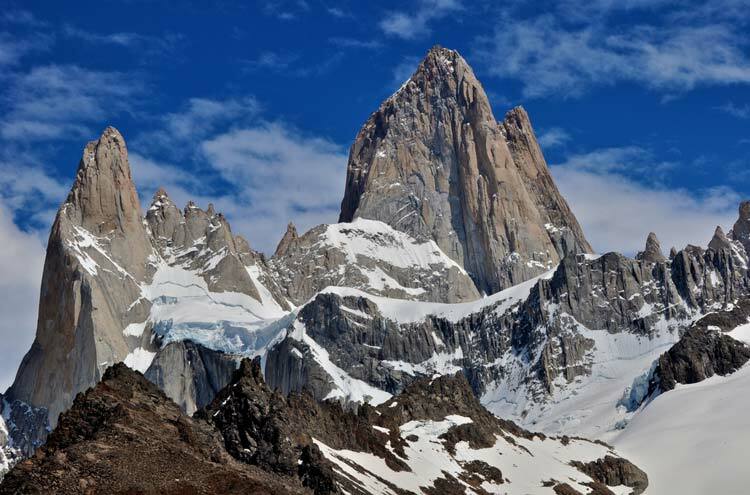 Follow the classic route as above, continuing on from camp Piedra del Fraile past desolate Laguna Electrico and circling back behind Fitz Roy, and down and around Glaciar Torre, yielding fantastic views of Fitz Roys north face. 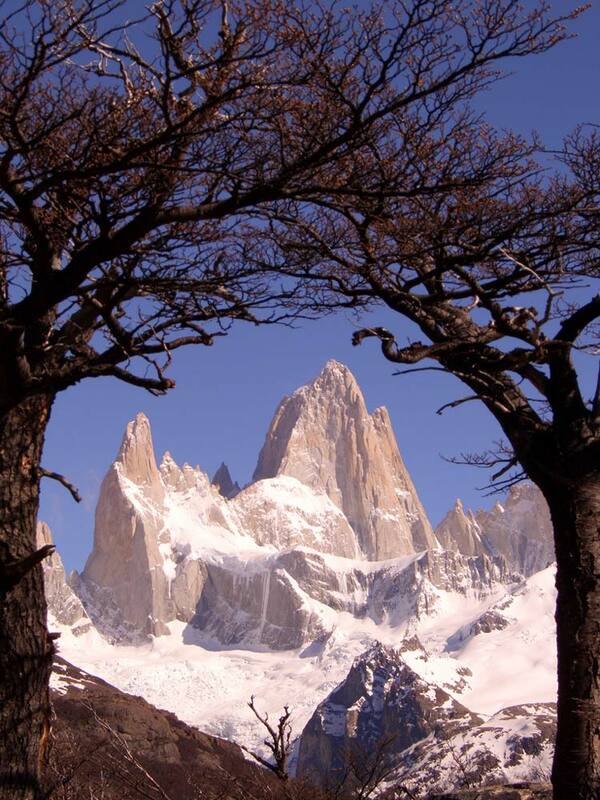 Los Glaciares National Park is found in the Santa Cruz province of Argentina, in South America's extreme south. Be prepared for terrible weather: storms are common here, even in summer. 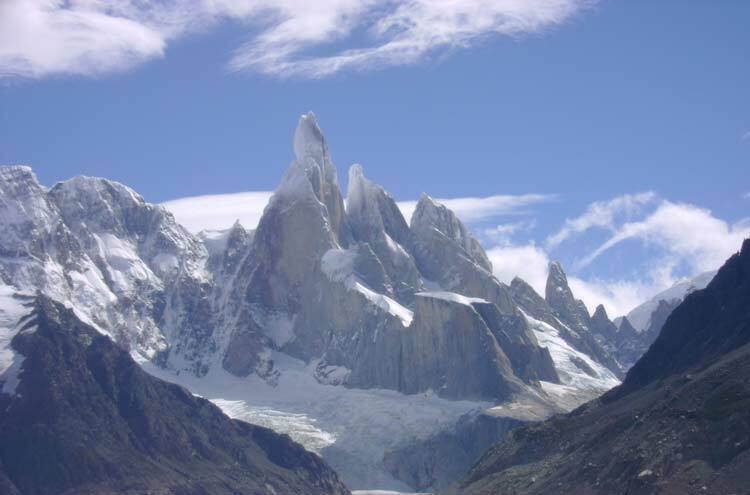 The Argentine and Chilean borders detour to pass directly over the summit of Mount Fitzroy, such that Cerro Torre, the region's largest mountain, is actually in disputed territory. 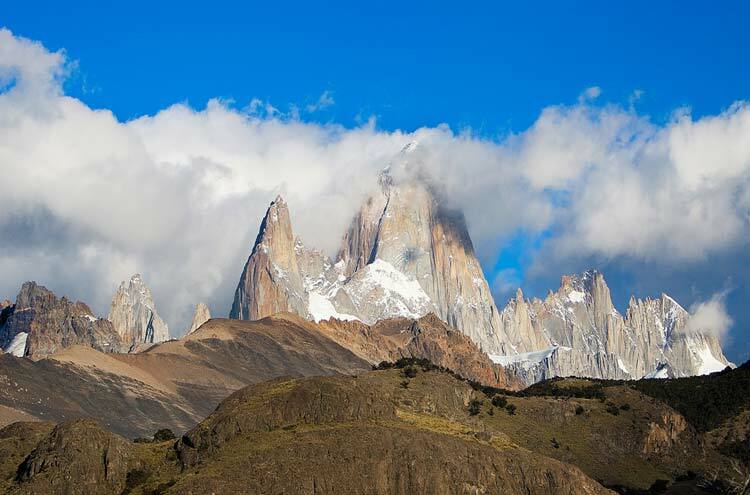 The spectacular Torres del Paine National Park is nearby in Chile.